Now that you’ve created a pop-up, it’s time to publish it! In this article, we’ll cover all the basics of publishing pop-ups so you can put them on your site. You’ll need at least one standalone pop-up. If you haven’t created one, check out our guide here. This article details the publishing of standalone pop-ups, created under the Pop-Ups tab under Conversion Tools on your dashboard and meant to be used on websites and blog posts. If you intend to use a pop-up on a Lead Page or Leadpages Site, you will create an on-page pop-up and publish it with your page or site simultaneously. Learn more here. Publishing pop-ups involves copying and pasting code. You don’t need to edit this code, but you’ll need to have access to your site’s code—or some way of injecting code into the webpages where you plan on publishing your pop-ups. Timed pop-ups and exit pop-ups do not work on mobile devices. Learn more here. We can provide limited support for issues you may encounter when publishing your pop-up. For troubleshooting problems specific to your site, you’ll need to consult your web developer (or site platform’s support options). Access publishing options by navigating to Conversion Tools > Pop-Ups on your Leadpages account dashboard. Then click the actions menu moreand Publishing Options. NOTE: If you’re using a pop-up built with our Standard (Legacy) Builder, this will open the editor of the pop-up and you'll click Publish at the top-right corner of the builder to access your options. The first three activate your pop-up when visitors take a specific action—that is, they click a link, button, or image that causes your pop-up to appear. Timed pop-ups activate after a designated period of time (that you set), and exit pop-ups appear when a visitor moves their cursor near the top of your page (signaling they’re about to leave). TIP: You can publish the same pop-up using multiple triggers. For instance, you might publish the same event registration opt-in at the end of a blog post as a text link and in your site sidebar as an image link. Each trigger provides its own customization options. The button link option, for example, lets you customize the button colors, roundness, and drop shadow. You can explore other triggers’ options in the publishing modal. 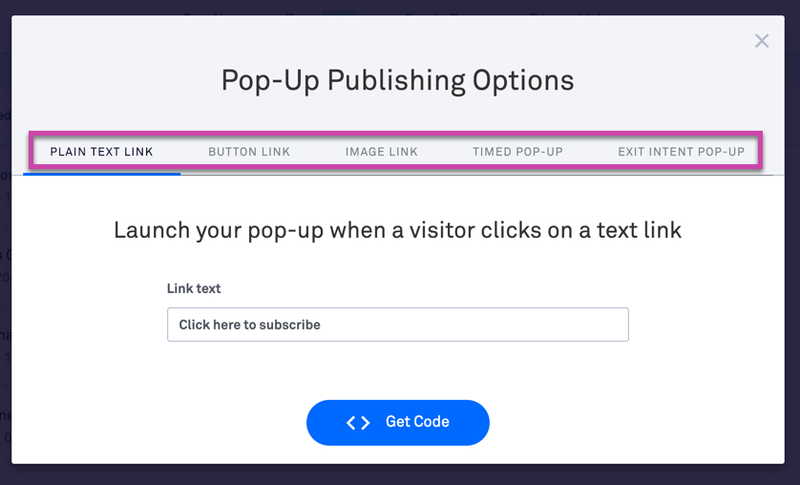 Keep in mind, any time you adjust a trigger’s options, it will change the publishing code for your pop-up—so you’ll need to re-paste the snippet to your pages. Once you’ve customized your pop-up's trigger, it’s time to put its code on your site. For the steps below, we recommend having your site’s code (for whichever page you’re publishing your pop-up to) open while you work. NOTE: If you’re not sure how to access your site’s code, you may need to consult your website software’s support options, or whoever set up your site. Navigate to your chosen trigger and click Get Code. Copy the entire code snippet. Paste the snippet in your webpage’s source code wherever you’d like your pop-up's trigger to appear. The second part of the code is your pop-up's trigger. You can paste it wherever you’d like it to appear on your page, such as within a blog post or perhaps in your site’s sidebar. That said, in most cases you can absolutely keep the code together, and paste the entire snippet where you’d like your pop-up's trigger. Keep in mind that timed and exit triggers are invisible—so you can paste your code pretty much anywhere on the page. Once you’ve pasted your code, we recommend updating your site and testing out your pop-up to make sure everything’s running smoothly! Open your page’s source code (using your browser or site editor). Check to ensure your entire pop-up publishing snippet is within your page’s code. For timed and exit pop-ups, open your publishing options. Make sure you haven’t set any options that prevent your pop-up from appearing (such as an extremely long time delay before launch setting). If you have, adjust the settings temporarily and try viewing it again. If you continue running into problems, try viewing your pop-up in another browser or on another device. Try clearing your cache—especially if your pop-up appears in some browsers but not others. Still having trouble? Reach out to our support team, and we’ll be happy to help troubleshoot with you. You can make any changes as needed even after you publish your pop-up. If you make changes to your pop-up itself, you can simply click Update—your published pop-ups should reflect any changes you’ve made. However, if you adjust your pop-up's trigger settings, you’ll need to go back through publishing steps above. That’s it! Your Drag & Drop pop-up should be on your page and you can start collecting opt-ins. Why does my pop-up open up in a new browser tab/window instead of overlaying the page? When you only use the pop-up URL (and not the entire code) your pop-up will open in a new tab/window. If you want to have the overlay effect on your page, you must embed the entire code produced under Publishing Options. Your embed code has been corrupted by other code on the page. You have inserted the embed code in the Visual Editor of the page instead of the Text Editor. If this happens, please save any changes and re-publish your pop-up to get a new copy of the code. Why does the video on my page restart when my pop-up opens? The script should ensure your video does not restart when someone opens your pop-up. Similarly, exit pop-ups do not appear on mobile devices, as there’s no consistent way to predict exit intent like there is for desktops. Most mobile browsers will automatically block pop-ups, therefore disabling timed and exit pop-ups. Can I use standalone pop-ups on my drag-and-drop pages? NOTE: If you do use a standalone pop-up on your page or site, you’ll need to look at the pop-up's analytics data to track opt-ins—as they won’t appear for your Lead Page or Site.